Two (2) Items Available -- Asking just $13.00 EACH -- MUST SELL -- Make me an Offer -- For 1 -- OR BOTH !! Buyer to pay U.S. Shipping, or items can be picked up. Cash or Money Order only. Make Great Gifts ! All Items in Very Good Condition ! Add a Splash of Color !! 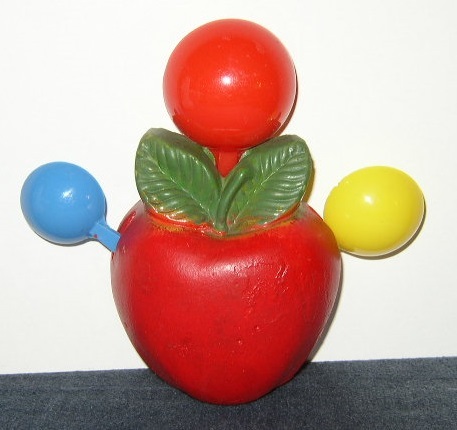 Item #1 -- Chalkware Apple with Measuring Spoons - Red TBSP, Yellow tsp, & Blue 1/2 tsp Measuring Spoons. Back has a wire to hang. Measures 5-1/4 x 5 inches (with Spoons) & Apple alone measures 3-3/8 x 1-5/8 inches. No Cracks or Chips ! -- White Background with Red Rim & a Shiny, Red Apple with Lots of Green Leaves & Stem, back has wire hanger. Measures 6 x 1-3/4 inches. No Cracks or Chips (only the tiniest nicks in painted areas, see pic) ! -- Yellow Background with 2 Shiny, Red Apples with Green Leaves & Stem, back has wire hanger. Measures 6-1/2 x 2 inches. No Cracks or Chips !